I buy some of the materials and equipment that I use as a painter at Action, one of the cheapest warehouses in Holland. Recently I discovered they sell a “plamuur” (the stuff that you use to fill holes in walls and woodwork, but I don’t know what is the English word for it) that is by far the best I ever used, for a price that is a third of the stuff I used before. But they also sell great brushes, screwdrivers, knives, etcetera. Today I visited Action and bought a scan radio in the shape of an i-Pod. For 2 euro’s. I had to travel by train for one and a half hour and I was tired, so I thought the radio would keep me awake. But I also like the thing for what it is: a radio (including a headphone and two batteries! ) 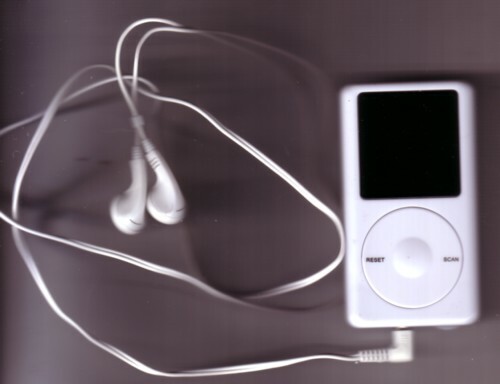 in the shape of an i-Pod for only 2 euro’s. In the train I was sitting opposite a well dressed young couple, that had done some expensive shopping. After a while the man noticed that I was listening to a fake i-Pod and whispered something to his wife, making her giggle. Meanwhile I was tripping on all kind of (unconditional) love songs on one of the about 20 radio stations the little thing could receive. I wondered what they were thinking and saying. I think that could not imagine that I was perfectly happy with my new toy. I have a 30 gigabyte i-Pod, but I gave that to my son. I preferred the 256 MB mp3-player, that I once bought in a toy shop for ten euro’s. But my son ruined that thing, and I never took the effort to buy a new one. There is music everywhere, and I don’t really need to have a private music player when I am not at home. I will not use the scan radio much either. But it makes me very happy to own one!